Today was another great day on the Couchsurfing front. Asher was up bright and early, partly from the 3am free range roosters as well as adjusting to the time change, so we were able to say goodbye to Manuel and Natalie before they left for school which starts at 7am. Natalie was eating very slowly hoping that she would miss her ride so she could spend more time with Asher. Andrea whipped us up some pancakes complete with Aunt Jemima. After Asher’s morning nap, it was time to say goodbye and Andrea made sure that we knew she was just a phone call away. We agreed that we would stay with her again when we passed back through El Progreso before heading south to Lago Yojoa. Carlos, the taxi driver from the airport, was happy to pick us back up and take us to a prime spot for catching a bus to Tela. There are no real bus terminals in Honduras. You just go to the side of the road and flag them down. The driver’s assistant jumped off, grabbed our heavy packs and launched them into the under cab storage. Alyssa chuckled when she saw a rooster squawk out of the way before being crushed by our super packs. By this time, the sun was in full force and temperatures reaching 36C. It was not long before Asher was down to his Maple Leaf printed Charlie Banana Cloth Diaper and enjoying a mini shower from our water bottles. 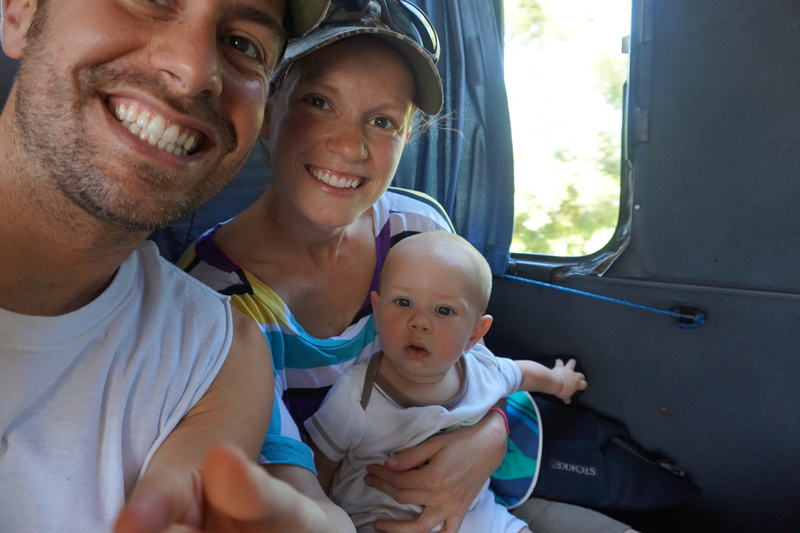 An Israeli backpacker on his way to Utila noticed Asher’s diaper and knew he was talking to Canadians. 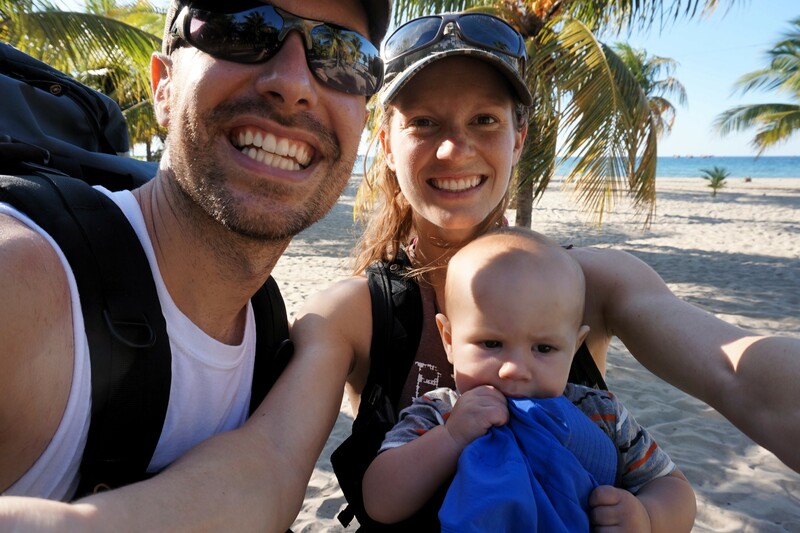 He was excited to see a backpacking baby and hoped that we might meet up on Utila. We jumped off the bus on the outskirts of town and opted for a taxi to take us directly to the Chinese restaurant near Central Park. Toothless Miguel carried both of our packs over to his ultra rustic cab, opened the door for Alyssa, then started his car with a screwdriver. AWESOME! 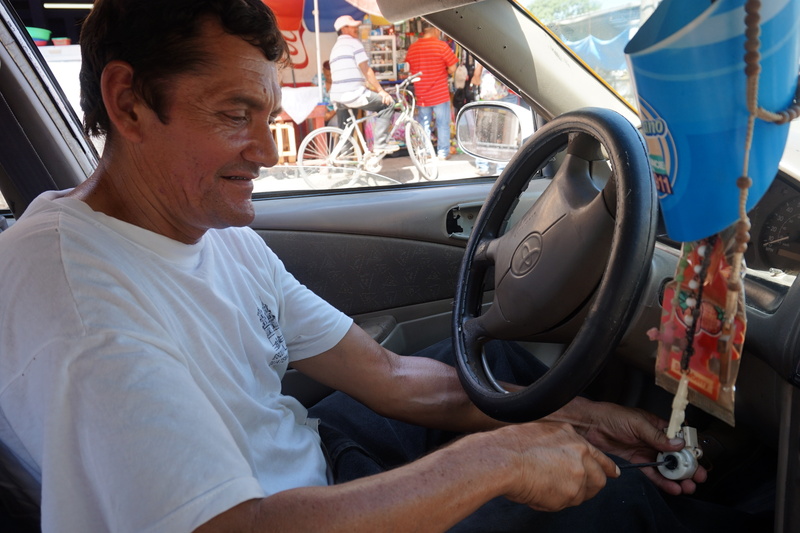 Miguel could speak some English and was happy to tell us that he learned English while driving his taxi for the past 10 years. I made gyrating motions as the car sputtered up the hill while Alyssa looked out the back window since his trunk flopped open and closed on each bump. He took us right to our location, unloaded our packs and gave us a honk as he drove away. Some people think we are a little crazy for Couchsurfing, but from the hospitality we have received thus far, we would be crazy not to. Andy was born in China and moved to Tela with his family four years ago. They run the local Yue Ling Chinese restaurant and manage a few hotels. We were greeted with the most sincere and warm smile and he quickly fetched two icy cold bottles of water from his cooler. Andy cannot speak English so we were forced to bust out what limited Spanish we have. After introductions, he ran out the door and pulled up a few minutes later in a pickup truck. We whipped our packs in the back, Andy held the door open for Alyssa, and we jumped in for a tour of Tela. 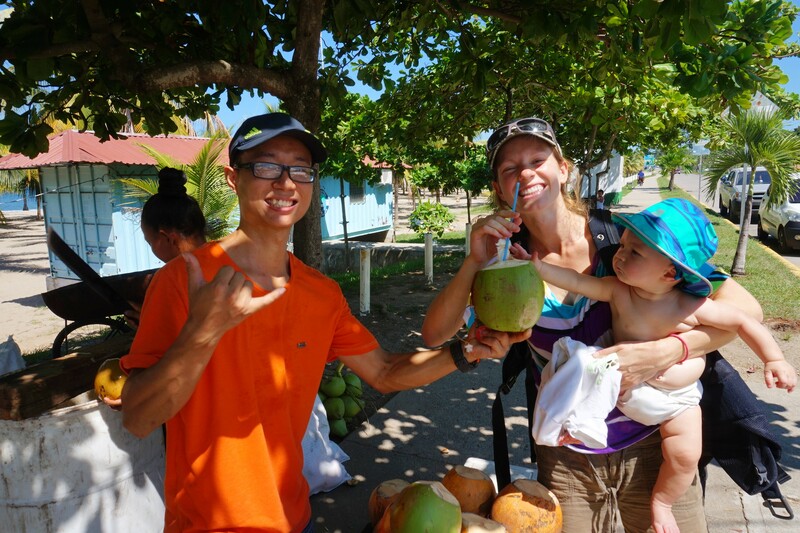 Andy took us right down to the main beach, insisted on taking family photos then bought us two coconuts so we could rehydrate from the electrolyte rich water. Andy then drove us to a hotel that he manages and arranged for us to have a free room with a fan and private bathroom. We were so grateful and Andy was just so happy to help. 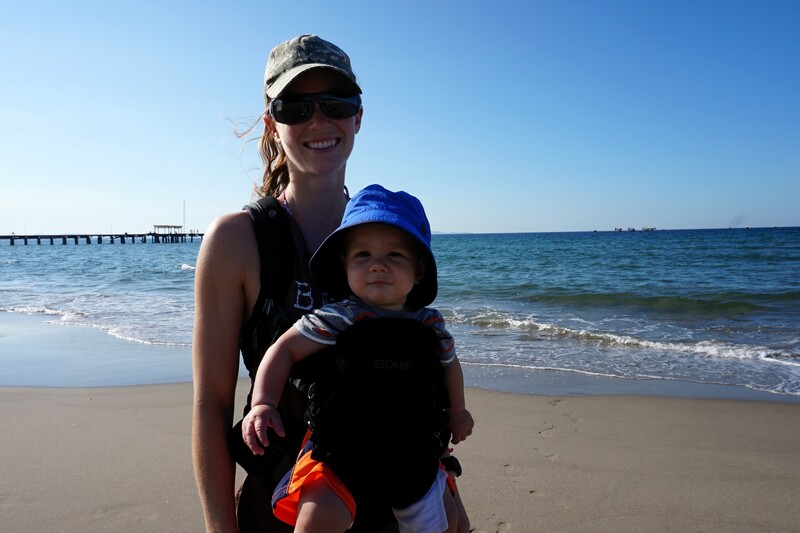 After a short nap in our toasty room, we decided to go check out the town and find the beach so Asher could have his first dip in the ocean. 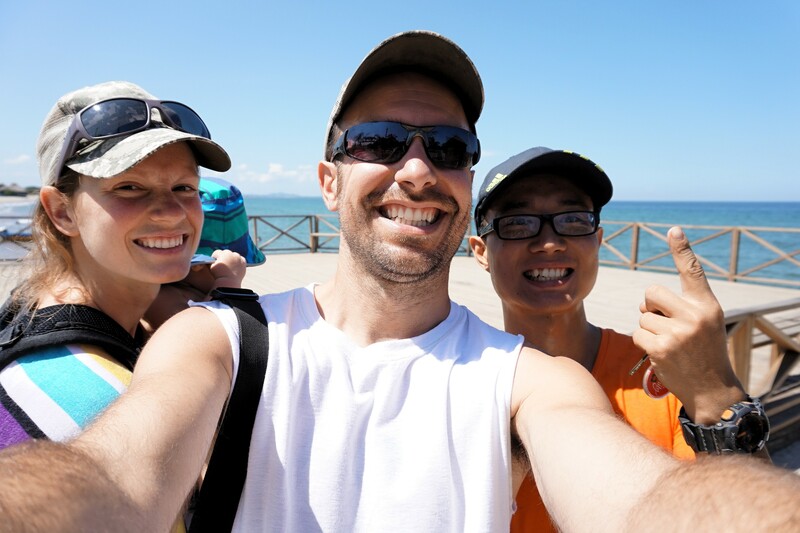 Tela is a classic coastal town with friendly locals, small comedor restaurants cooking up traditional cuisine and, Alyssa’s favorite, bakeries. 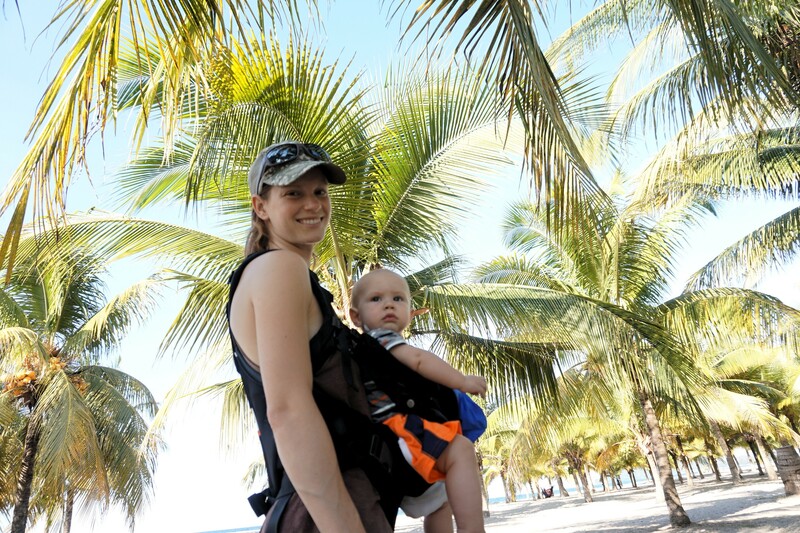 We enjoyed a nice stroll along the beach, took cover under rows of shady palms, then made our way back with a loaf of whole wheat bread (whole wheat bread was impossible to find last time we were in Central America!) and a cinnamon bun. Andy popped back over to say hi and noticed how hot Asher was in our sauna of a room. He quickly upgraded us to a room with AC saying “for the baby, for the baby.” What a difference it made. Asher downed a huge bowl of oats, banana and some baked potato while we polished off another plate of rice, beans, fried plantains and salad. While Alyssa put Asher down for the night, I played music for Andy and his 2 year old cousin. It was great to play Twinkle Twinkle and have Andy sing in Spanish while I sang in English. Our little ukulele is a great ice breaker. When Andy found out that I could also play the guitar, he rushed out and was back in minutes with one. He has always wanted to learn how to play and so we spent the next few hours learning some chords and jamming. Since Andy is the boss, he knew everyone there and was proud to let them all know I am his guitar teacher. The open air restaurant was rocking to the Beatles and the local Garifuna (descendants of Afro-Caribbean slaves) loved when I busted out Bob Marley’s Redemption Song. Couchsurfing has truly opened up a new way of traveling for us and as we snacked on bread and all natural peanut butter, we talked about how blessed we were to meet so many great people. Oh, that beach looks so inviting! Glad you finally made it. Hi Jim and Allysa and Asher. I linked to your blog through Ryan and am really enjoying reading about your adventure. Brave souls! A dear friend of mine spent a lot of time in Honduras and actually wrote and recorded a song about Tela. Good wishes to you on your journey. Charmaine (Ryan Smith’s Mom). Thanks for tagging along. I bet you are excited for Ryan’s little one. We can’t wait either. We would love to hear that Tela song. Happy Holloween from London Ontario. We miss you guys already. We will be reading your adventures to the kiddies at time. Happy Holloween from Team Slee. We were up late lastnight eating holloween candy and catching up on blog. We look forward to your adventures. We miss you guys and know Team Slee had a blast for Halloween. Thanks for following along and for the comment. Sean, I posted a photo for you of the scaffolding next to our hostel. Show Jesse this one! What an awesome journey you are on! I love the Maple Leaf Charlie Banana cloth diaper and how it lets others know you are Canadians! Asher looks so content in front of the ocean. I wonder what he thinks of seeing such a massive body of water after Lake Cecebe. It is so wonderful how music is universal and a true connector. I would have loved to have heard, “Twinkle, Twinkle Little Star” done in two languages. It sounds like a wonderful, wonderful time you are all having, and they with you! They are enjoying you and learning from you and that is lovely. Up here, we have had a ‘couchsurfer’ of our own: Eric Rainey, you may have met in North Bay at the family reunion, just left this afternoon with a truck load and dog of his son’s Russell who is finishing off his fourth year at Acadia. We had a home-made lasagna and salad lunch with, sadly, store-bought buttertarts and Russell had an Acadia Football meeting to attend after a nice win yesterday and planning for their next game in Antigonish, NS this coming Saturday, which Eric says he will come back to watch, as this may be Russell final game of his University career. Next weekend we will have our friend Eric Goodwin here from Milton to watch his son, Nigel, play soccer for Acadia and the following weekend, we will have Cathy and Craig Ferry here for parents’ weekend and to watch Tyler play hockey. It is such fun to host our friends and family out here and oh ya, Aileen was here a couple of weekends ago to visit with Taylor for a week. She stayed with Taylor at her apartment but we had a nice meal upon her arrival and then another visit before she left to hear all about their girl-time week before Aileen left to return to St. Thomas. In May for Russell’s and Taylor’s Graduation, we will see the Rainey’s return with 84-year old Auntie Janine as well as Gord, Aileen and Shawn Pearson. We are so looking forward to a weekend of family fun and celebration! So glad the couchsurfing is going well!